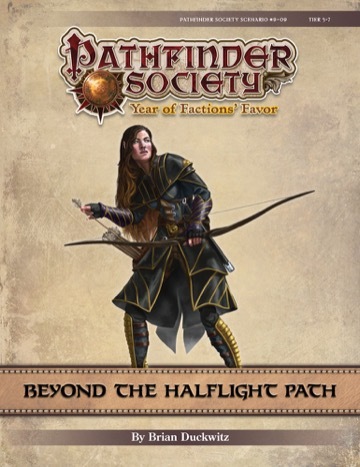 Beyond the Halflight Path is an evergreen, replayable scenario designed to provide a flexible adventure that confronts the PCs with a variety of threats more common to higher-level characters. The scenario has nine different possible villains, as well as myriad other options for the GM to customize the dangers that the PCs face. I will be there although I am new so I don't have a character in that level. What time does it start? I forgot to note. This will be a daytime game on Memorial Day. We're starting at noon. Welcome kellynl. We'll have 4th and 7th level pre-generated characters that you can use to get started. Have you looked over the Roleplaying Guild Guide? It's a free download on pazio.com. I'll be there as well. For holiday day games such as this we usually start at 11AM. We can have a pregenerated character for you. I assume you've not played organized PFS play before? I'll be there. Well have in tier pregen characters to use. She played one table a couple weeks ago, but is still very new. I will be there. I will have a level 3 rogue or a level 4 or 5 swashtigator. I can play a pregen if we go high. I have had someone working with me to teach me too. I have played in just a little bit of unorganized play as well. But yes, still very new. Gino never actually makes it to the store by 11. So, I'm cutting him some slack. I would like to join but only have a level 6 in this tier range.